William E. Gross, M.D. is board certified in Otolarngology and graduated from the University of Virginia in Charlottesville, Virginia, where he received his medical doctor degree. After graduating Dr. Gross relocated to Columbus, Ohio to complete his residency in Otolaryngology at Ohio State University. Dr. 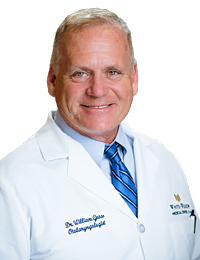 Gross is a highly skilled, board-certified physician and was voted "Top Physician" for Nashville Region by Castle Connolly in 2015 before relocating to the Emerald Coast. He pioneered the Endoscopic Lothrope Procedure, which is a standard of care with frontal sinus conditions for patients with sinus tumors at the scull base. He specializes in the diagnosis and treatment of diseases and disorders of the ears, nose and throat for both adult and pediatric patients, and provides a broad range of care. Dr. Gross also specializes in the treatment of common issues such as runny nose, chronic ear infections, sinusitis and nasal polyps, as well as, adenoid and tonsil removal and head and neck surgery. Dr. Gross is also one of the only Otolaryngologist on the Emerald Coast that is fluent in Spanish. In his spare time, Dr. Gross enjoys time with his wife and three wonderful, young children. He has participated in numerous medical mission trips to South America over the years, which is actually how he met his wife. To relax, Dr. Gross enjoys fishing and playing tennis.